Found 4 file extension associations related to Autodesk 123D for Mac and 3 file formats developed specifically for use with Autodesk 123D for Mac. Autodesk 123D products are useful tools for making things—for quickly giving shape to your idea, exploring it, and most importantly, making it. The Autodesk 123D family is free products that connect simple 3D modeling tools together with content, community, and fabrication services, so anyone can create, explore, and make their project. 123D Design—Create a digital model on the iPad, on the web, or on your desktop, and then directly 3D print or fabricate it. 123D Catch—Automatically convert ordinary photos into extraordinary 3D models leveraging the power of the cloud. 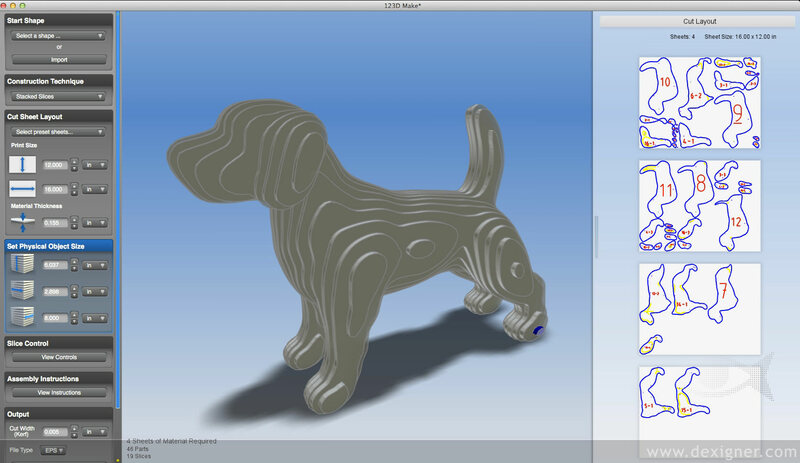 123D Make—Transform 3D models into a cut pattern with animated assembly instructions for making artful physical creations. 123D Sculpt—Sculpt and paint interesting and realistic 3D shapes with your fingers digitally on the iPad. If you need more information please contact the developers of Autodesk 123D for Mac (Autodesk, Inc.), or check out their product website.